Tom Thomson was an influential Canadian artist of the early 20th century. He directly influenced a group of Canadian painters that would come to be known as the Group of Seven, and though he died before they formally formed, he is sometimes incorrectly credited as being a member of the group itself. Thomson died under mysterious circumstances, which added to his mystique. He disappeared during a canoeing trip in Algonquin Park on July 8, 1917 and his body was discovered in the lake eight days later. The official cause of death was accidental drowning, but he was found with fishing line wrapped around his leg and he had a head injury There are still questions about how he actually died. Love the personification of the windswept trees. Very visual, beautiful writing, Karen! Being very much alive themselves, I think trees do hold memories too. Interesting poem and comments about the artist's life. His death does sound suspicious. And indeed, the memories of today WERE the dreams of tomorrow. Thanks for poetry jamming. A great respecter of trees, a tree-hugger to some, I'd never considered them in exactly this way, hanging onto memories. But you are so right. So right. There is something so Japanese about the painting, perfect for a haiku, and yours definitely does it justice. Yes, trees do hold tight to memory even in the wind. Enjoyed your comments on the artist as well and the poem reflects some of the mystery of his death after reading the comments. Trees hold all our secrets. You couldn't have said it better!! Judy said it quite well ... the artwork lends itself to the Japanese haiku. this is so beautiful and brings the painting alive! just gorgeous! Excellent treatment of the pic. the beauty and strength of your lyrical haiku coupled with this emotive painting have swept me away to memories of my own. thanks for dreaming out loud. You did a GREAT job of writing a haiku to go with that piece of art! Really nailed it :) I liked it. So beautiful. 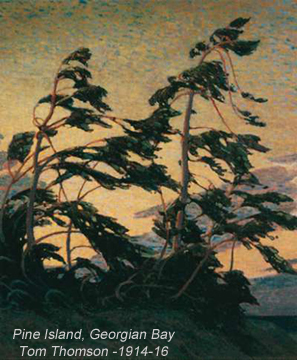 Tom Thomson painted ocean and trees along my beloved west coast, too, where trees often have the jagged windswept look of a species that has to hold on tight during the winter winds. Love your poem. Trees have memories too.. oh that is an image that's very thought provoking.. interesting too! I love this. I used to be a guide, one of the many jobs I have had over the years. IO can see these places in my memories and remember canoe trips through miles and miles of wilderness. Nothing like the Big Lake. Very nice. so many long forgotten dreams remembered with the reading of this haiku. The memories keep the dreams alive. As a person who loves the story behind the object, yours is a perfect haiku and the painting is magical. I had never heard of this artist before. I so love when I learn something new. Fabulous haiku to go with the artpiece... I especially love the second line... ('trees hold tight...) beautiful! Tom's art is some of my favorite. The painting and haiku go so well together, love them both. This is wonderful...I can imagine just such a night!